We need diverse books. For loads and loads of reasons, but most importantly because we live in a diverse world with diverse readers and diverse perspectives. This is my seventh year of blogging and while I'm pleased to see how the YA community and market has evolved to have better representation of diverse topics and characters, we still have a lot of work to do. First is the #WeNeedDiverseBooks campaign. You can read all about it on the official tumblr page. The plan? Make the internet explode with diverse book recommendations and reasons we need diversity this Thursday and Friday, and then on Saturday go out and buy diverse books. You don't need to spend a lot of money. Buy one paperback. But help support diversity of all types, help demand change. Use the hashtag #WeNeedDiverseBooks! My senior project in college was a study of the evolution of the lesbian protagonist in YA books. I blogged about it here. The list is in desperate need of updating, which is my mission this week with Amy Rose Capetta. Amy Rose, in addition to being my book recommendation soulmate, is the author of Entangled and Unmade, which features racially diverse characters and an LGBT couple! Hooray! We'll publish our massive list on Thursday or Friday! The second campaign that I am super excited about is the Handsell Off campaign! Read about it on Shannon Hale's tumblr. 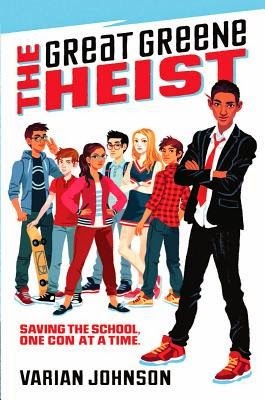 The short version: booksellers are challenged to handsell Varian Johnson's new MG book, The Great Greene Heist! Varian is a VCFA grad (VCFA represent!) and his book is going to be so great. It features an African American boy, the protagonist, prominently on the cover. When I think about the white-washing that was happening with YA covers just five years ago, it makes me so incredibly happy to see this awesome cover and so many awesome people rallying behind it. I've had multiple copies of this book on pre-order at my store for over a month, and I can't wait for it to come in. It's released May 27th, 2014, but go and pre-order it! Everyone can get involved--readers, booksellers, bloggers, authors. Check out Shannon's tumblr for all of the details! #WeNeedDiverseBooks. We need your help, however you can get involved. Go forth and hashtag it up! Comment here with your recommendations--I'd love to read them. And talk about diverse books--not just online, but in real life, too! ETA: Here's a giveaway for teachers and school librarians, hosted by Beth at A Foodie Bibliophile in Wanderlust! Win a copy of When I Was the Greatest by Jason Reynolds!